DESTINATION, Bishnupur village of Patrail Union at Tangail district. It was early in the morning on September 29. We were a team of journalists on our way to attend the Indigenous People's Cultural Exchange Programme. It was a three-day programme arranged by the Society for Environment and Human Development (SEHD) with the assistance of Christian Aid at the Bishnupur Noya Krishi centre of UBINIG. Objective of the arrangement is to abridge the cultural gap between the Bangali majority and the ethnic people of the country. "The knowledge about these small ethnic groups is usually very limited among the general Bangali people. We wish to create a platform to allow everyone to enhance their insight about the rich cultures of these people", tells us Partha Shankar Saha, coordinator of the programme. Under this exchange programme, SEHD will arrange a series of cultural events all around Bangladesh. Cultural representatives of different indigenous groups will perform their traditional music and dances and share their experiences and knowledge of life. This was the first programme of the series. 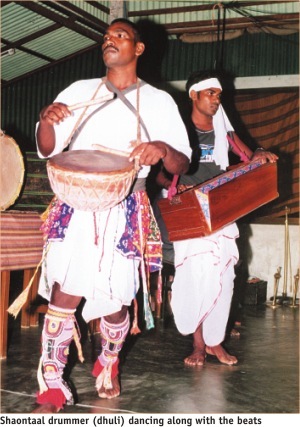 Oraon and Shaontaals from the northern part of the country were the first ethnic groups to present their culture. We joined on the third day of the event. When we arrived at the Bishnupur centre it was raining. Upon our arrival we were entertained with mouth-watering traditional teeler naaru and moa. The morning session of the programme had already begun with the representatives of Oraon and Shaontaals depicting their way of life and experiences. Artefacts used by both the groups were displayed. Lunch was followed by the main event, the lively cultural programme. 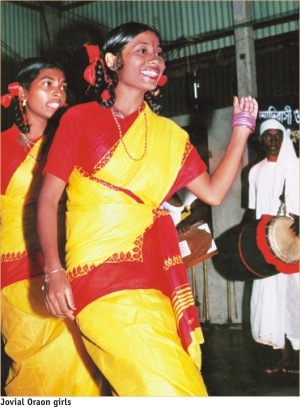 Dhumkuria Adivashi Shilpigosthi from Puthia, Rajshahi through the beats of dhuck, madol, and dhol portrayed marriage ceremonies and festivals celebrated by Oroan and Shaontaals. Moving to the beats of the song 'dhitang dhitang madol baaje' the performers of the shilpigosthi enchanted the audience with their colourful traditional outfits and charming choreography. Both groups are followers of the Hindu religion. Farming is their livelihood and they worship nature. The sense of ownership is absent in their believes. They believe it is god who owns everything and as the children of god they simply take whatever amount they need in exchange they protect their natural surroundings. Karam is the most important festival of the Oraon. During the bangla month of Bhadra they plant branches of karam tree in the middle of the yard and worship 'ponchoshoshyo'. Seven days before the festival, five types of seeds are planted in a basket. If they grow perfectly, it is believed that the crops this year are blessed. They dance and chant along with the basket trying to please the karam. They worship, hoping all the disasters and misfortunes would go away. Dhumkuria Adivashi Shilpigosthi performed the karam pooja festival through dances. During these festivals they entertain guests with Haria, a type of homemade rice beer. The flute is an integral part of these people's lives and almost every young boy of the community usually caries one. Young boys often choose their partners during these festivals. Performers of the shilpigosthi also showcased Shaontaal marriage rituals. The bride is carried on a basket upheld by her relatives, and the groom has to get up on his sister's husband's shoulders in order to place the shindur on his wife-to-be's forehead. In the family both husband and wife perform the duties in farming. While they are gone to the field for work usually the grandparents take care of the young members. Both Oraon and Shaontaals lead peaceful isolated lives. However, they are beginning to feel neglected. Amidst all the festivity Shurendranath Shardar and Anil Tudu from Puthia, Rajshahi explained how they are still mistreated by a segment of people. "We are not yet welcome in Bangali households in our area. If we enter a tea stall we are usually given separate cups for drinking tea. We feel humiliated", explains a disgruntled Shurendranath. "Our people lost their land. Our community doesn't really care about deeds and taxes, as the sense of ownership is absent in our religious beliefs. Others take advantage of this innocence and grab our land", describes Tudu. They feel that the current development process involves nothing but a few kilos of rice and a little amount of money and this type of development does not sustain for long. "We want development but not like this. People's notions about us need to be changed. We are peace-loving citizens of this country just like everyone else", adds Shurendranath.